Considering a White Chocolate Fountain? The ultimate centrepiece for any event! A showcase topic of conversation! An ice-breaker at any occasion! A pure-white, chocolate fountain is rapidly becoming one of our most popular requests. In our 'rainbow range', we again use only the very best, fountain-ready, Barry Callabeaut, Belgium Couvature, Chocolate callettes, unlike other providers on a budget that may use vegetable or cocoa oil, or artificial tints. Fresh fruit, marshmallows, sugared donuts and cream-filled profiteroles are delicious….but taste even better dressed in white! Strawberries and marshmallows are a classic combination to dip into chocolate but why stop there? See our dips and chocolate page for further ideas or view our gallery. Chocolate Fountains have now far-surpassed the buffet dessert, even the traditional wedding cake and is a great option to a fully catered display. 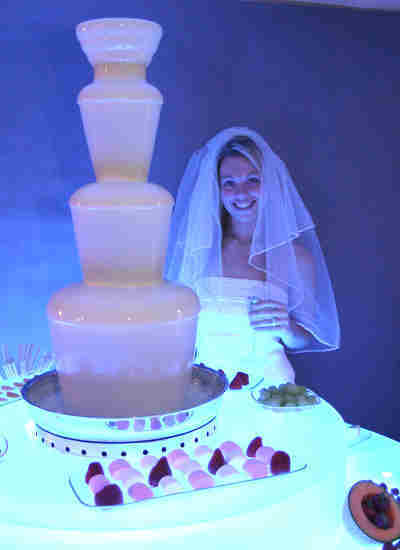 White chocolate fountains are most great for girly events, hen nights, birthday parties or pure, white-themed weddings. 4-Star 'Scores on the Doors' Food Hygiene Rating. Call Bob or Michelle on: T: 01242 700270 or M: 07816200045 to talk all things chocolate today, email us or use our online enquiry form and view our coverage area/s near you. LOOKING FOR UK-WIDE CHOCOLATE FOUNTAIN HIRE IN YOUR AREA?